To be bathed in sound can be so healing, and a route into deep meditation at the same time. It has to be the right sort of sound though - drums, Tibetan singing bowls and magnificent larger vessels made from quartz crystal are best. Our sound bath on Thursday, 12th May was presented by Jan van der Elsen on the lightship Sula, moored at Llanthony Quay just south of Gloucester Docks. Jan and his wife Agnes also used seeds inside a bamboo casing which sounded like wind in the trees and other instruments including a huge Indonesian gong, Shamanic drums, Tuning Forks, bell strings and rattles. Played harmoniously to members of Slimbridge Dowsing Group plus a couple of guests, we all agreed it was the most soothing, calming experience. Below 8hz, of course, you are asleep. At the other end of the scale, someone who is hyper, in a panic or even in a fight-or-flight situation, will have a brain vibration of 17 to 20 hz, best avoided. If you envisage your body as being an orchestra, it follows that if any part of it goes wrong, the whole thing needs re-tuning. As the famous playwright William Congreve said, ‘Music hath charms to soothe a savage breast’, and it does have a calming influence, although of course some modern music can have the opposite effect! 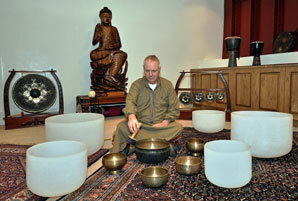 Jan van der Elsen with his Tibetan and crystal singing bowls. After the wonderful experience of the healing sound bath on historic Sula on Thursday afternoon, those present were persuaded that maybe meditation should be a part of our lives too. Sula lightship is open to the public and offers a variety of holistic therapies and complementary treatments.